This phenomenon has been referred to as breakthrough shock, snap through shock, reverse load or negative tonnage. All of these terms mean the same thing. Break through shock is typically associated with a loud boom and press vibration. Specifically it is the moment in time when the press has built up enough force that it exceeds the shearing strength of the material and the material fractures. 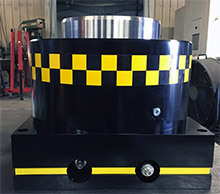 The sudden release of the stored up energy in the press frame, hydraulics, mechanical clearances and die occurs in less than twenty milliseconds. 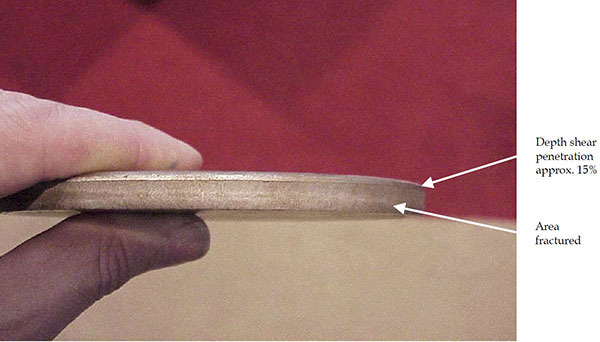 The press components, which are designed to be put into tension, are suddenly put into compression, much like releasing an extended rubber band. 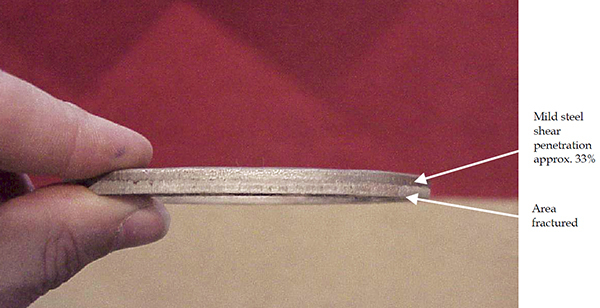 In order to estimate the magnitude of this force, it is first necessary to understand what happens during a press blanking cycle. As the ram descends downward and the die contacts the work material, a resistance force is quickly built in the press frame. The slide is counter pressured, upward, eliminating all clearances in the mechanical or hydraulic linkage between the slide and the crown. The crown, being rigidly connected to the bed of the press through the side housings, resists this load and continues to build force until the shear strength of the material is overcome. The Y ordinate of the graph measures press force in tons. The X ordinate is a parameter of cycle time, in seconds or slide position measured in degrees of crank rotation. The resulting force curve shows the rapid tonnage build during the portion of the cycle after engagement of the material. At the peak, the material begins shear and the steep incline downward illustrates the release of the captured energy after fracture. At the point where the curve passes the X ordinate, a negative tonnage (reverse load) is generated in the press frame. Next learn about some ways to solve breakthrough shock.